Pt. Vinayak Torvi is a well known artiste of the country who has carved a niche for himself in the realm of music. Gifted with powerful resonant voice with rare rhythm and rich melody , he has been capturing music lovers all over. When gold emerges through fire, it is burnished with fierce pure light. Similarly, this talented Hindustani musician has acquired his melodic dazzle after years of severe discipline. What groomed him into this perfect singer are his twelve years of gurukulavasa under Gayanacharya Gururao Deshpande who was the doyen of 'Gwalior Gharana'. He absorbed the intense, intricate treasures of classical music in the Gwalior as well as Agra Gayaki, from Gururao. Vinayak's school and college days were studded with awards and prizes in the music. But further laurels were in store for this hard working, dedicated young artiste. A commerce graduate, he joined Canara Bank and today he serves as a manager. Torvi acquired Bachelor's and Master's degrees in music securing first rank, from Karnatak University, Dharwad. As a post graduate student at the university, he had the rare fortune of tutelage of stalwarts like Gangubai Hangal, Pt. Basavaraj Rajaguru and Pt. 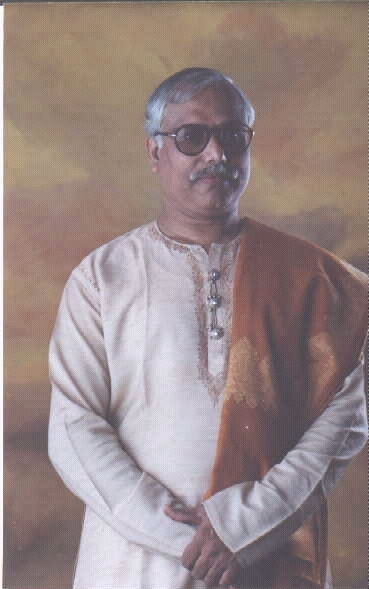 Mallikarjuna Mansoor. - Mysore Durbar Hall during Dasara festival. - Sawai Gandharva Sangeet Mahotsav at Pune. - Sangeet Research Academy, Calutta. - Bharat Integration Festival at New Delhi. - 'Dakshini' during SAARC International meet. He has toured abroad for music concerts and lecture demonstrations. He has audio cassets and disks to his credit. He has gained wide popularity for his 'Jugalbandi' performances with eminent Carnatic artistes. In spite of this excellence in the field of music, Torvi is a humble, dignified artiste and an ardent devotee of Lord Chidambareshwara of Murugod. He says that Music is pathway to God and needs devotion and dedication to achieve salvation. He believes in quitely striving for perfection in the realm of raagas and rhythms. Severe, unrelenting practice is his tool to savour the highest peaks of victory that music and its divine melody can offer. Torvi's contribution to the world of music is enormous. He is a revered 'Guru' to many performing artistes and aspirants. His love, respect and gratitude to his Guru, has blossomed into formation of the Gururao Deshpande Sangeet Sabha. This trust is working towards furthering the cause of music in memory of Gururao. artistes from all over India participate. Thus Torvi has been instrumental in transforming Bangalore, predominantly a centre for Carnatic music into one of the prominent centres of Hindustani music in the country. As a member of the Sangeeta Nritya Academy, he has successfully implemented many new schemes for the promotion of classical music. Above all this, Vinayak Torvi's thirst for knowledge in music seems never quenched. He still seeks guidance from Pt. Bhimsen Joshi and continues his journey into the depths of 'Sur-laya Sagar'. Pt. Torvi, setting himself as an example, forsees a bright future for classical music provided the coming generation has commitment, devotion and dedication. 1. The Government of Karnataka State, India, has shown its appreciation of Torvi's remarkable contribution in the field of music, by honouring him with the Rajyotsava award. 2. His nomination to the state Sangeeta Nritya Academy for two terms was due to his vast experience, through knowledge of music and ofcourse his amazing talent. The academy has conferred on him the title of 'Karnataka Kala Tilaka'. 3. He was awarded the research fellowship by the HRD Department, Government of India, New Delhi. 4. 'Surmani' National level award was conferred on him by Sur Singar Sansad at Mumbai during Haridas Sangeet Sammelan. 5. Sangeeta Ratna Chowdaiah Memorial award was conferred on him. Torvi's deep & melodious rendition of the aalaap in mandra saptak was appealing. Rare aalaap, khatka- murki, brilliant combinations of the notes established the ascent of raag Yaman Kalyan in his own innovative style. His taal sense was striking in the laya patterns. His taans in aakar were clear & well modulated. Pt. Torvi started with the melody Bageshri and gave an appreciative exposition of the raag both in the lower and upper octaves. The layakaris in the madhyalaya were marked by the application of artistry & technicalities. Torvi used his rich & resonant voice well, the vilambit framed in a slow ektaal to air a wide range of boltaans after a meticulous badhat. Taans followed laya brakes & the antara taans were especially good. An exponent of Gwallior gharana. Torvi delineated raag Multani in a methodical way with effortless taans in faster tempo showing commendable maturity of expression. Bouqet of blissful Bhajans - Torvi held the audience spell bound for nearly three hours by this multifaceted mosaic created by soulful exposition. The rendition of raag Deskar was much removed from the conventional chinched phrasing. It was sustained through well balanced & rounded off compositions in madhyalaya and dhrut teentaal. The high spot of the entire programme was perhaps the vocal recital of Pt. Torvi - His exposition was methodical & the improvisation revealed a depth of tone, the singular blends and set off the dintinct character of raag Poorvi. Torvi joined the star galaxy in the morning concert by presenting raag Todi & Aliya Bilawal. He is a musician with lot of zeal & youthful idealism, conscious both of the form and content of music. He touched upon all the subtle facets that set the characteristics of raag Bhoop & Basant which made the concert highly engaging musical experience. His ready voice, methodical delineation & the variety combined to make exposition of Mian Ki Todi and Shudh Saarang enjoyable.